Sunday, April 14 | 5 p.m.
and Christ’s resurrection from the grave. from God’s Word through worship and music. Travis Cottrell is a highly respected worship leader, songwriter, arranger, and author. He has won multiple Dove awards and nominations, performed in Carnegie Hall, recorded at Abby Road, led worship in churches and at conferences worldwide. Cottrell has used his unique blend of rich hymns and modern worship songs to create a unified atmosphere in worship. For the last 21 years, he has worked alongside Beth Moore as the event worship leader for Living Proof Ministries. Cottrell has seen God do immeasurably more than he could ever ask or imagine. He serves as worship pastor at Englewood Baptist Church in Jackson, Tennessee, where he lives with his wife Angela and their three children—Jack, Lily, and Levi. Recording artist and author, David Ask, grew up in a small town in Minnesota but now lives in Hendersonville, Tennessee, with his beautiful wife and children. His latest project, What A Perfect Day, is a beautiful mix of sacred and musical theatre. Cindy Roberts is a singer, a teacher and a worship leader in Nashville, TN. She has led worship for churches and women’s conferences all over the U.S. She performed and recorded with Walt Disney World’s Voices of Liberty, and is currently a soloist and session singer in Nashville. Cindy and her husband Dave established Middle Tennessee Performing Arts Academy in 2011, where she acts as director and vocal instructor. Cindy is grateful beyond words for her husband and their beautiful children and grandchildren, who daily inspire her song. Bass/baritone veteran of oratorio, opera, and musical theater, Rod Fletcher has performed with the Fred Waring Show, Montovani Orchestra, Re’Generation, Disney’s Voices of Liberty (12 years), and the Grand Ole Opry (background singer for 22 years). He is also a Nashville session vocalist. Fletcher resides in Brentwood, Tennessee with his wife Joy and daughter Jaclyn. David Hamilton is an accomplished musician known for his versatility, artistic passion, and for his reputation as a premiere orchestral arranger, respected conductor, producer, pianist, and composer. His music spans a wide range of musical genres. Hamilton has conducted leading orchestras across the U.S. and at Carnegie Hall, The Kennedy Center, and on scoring stages around the world. He is also blessed to serve as a lay leader in the music ministry at Brentwood Baptist Church. The quote by Saint Iraneus “The Glory of God is man fully alive” holds deep meaning for David, and it rings true with the message of “The Passion”—God’s redemption shining in our great need of grace. 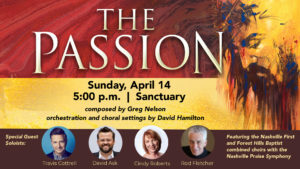 Greg Nelson is a composer, producer, and author who has written or co-written several Christian songs and extended musical works for soloists, orchestra, and choir. Nelson spends his time writing, as well as encouraging and mentoring young creatives. He travels to Russia every year to teach songwriting at a worship conference and works with aspiring artists and producers, one-on-one, in studios there. Greg lives with his wife Pam in Franklin, Tennessee; they are active members of Judson Baptist Church in Nashville. They have two children and four grandchildren. proclaiming the Good News of our Risen Lord and Savior, Jesus Christ!